I have a few pieces of eye candy for you on one of my favorite days of the year. 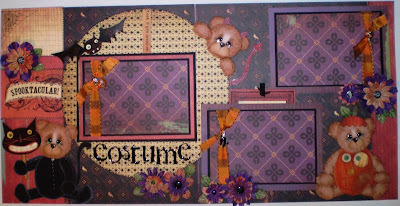 This is a fabulous layout created by Patti (ndbuckskin) using Cosmo Cricket's haunted line. I do have to say that this is spooktacular! A few treat buckets for our favorite teachers using more Cosmo Cricket and some Prima festive buckets. And more Cosmo Cricket! Can you tell which Halloween paper was our favorite this year?? Have a safe and fun Halloween everyone!! OK, I knoooow it's two days before Halloween...but I'm just in the Christmas spirit! Here's a little wall art for Christmas made entirely from Bo Bunny Basic Dots. I love this paper, nice and thick...you will never use plain cardstock again! This was a super quick and easy project...I found an old frame in the attic, free hand cut the trees and snow bank, then punched out the circles. The "holidays" is a piece of chipboard I covered with paper. Inked it all...added a few buttons...easy, cute and fast! 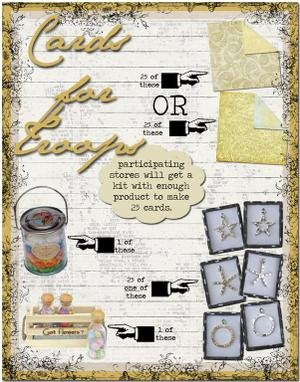 Prima Marketing is partnering together with a number of scrapbook stores for a great cause! We are thrilled to have been asked to help with this effort and would love your help! Prima has sent us enough product to create 25 cards for the troops. If you are in the Jackson, TN area and would like to pick up a kit or kits to help make these cards contact us and we will set aside a kit for you. If you don't live in the area and would like to participate let us know and we will send you the kit with your next order. To find out more about this effort, you can visit Prima's blog or check out the this link to see if a LSS near you is participating. You can send the card/cards to the soldiers of you choice or send them to one of the many organizations that accept cards for the troops including CardsforHeroes.org or Scrapbook Royalty. Thanks for your help! 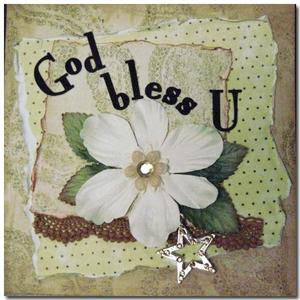 Prima has provided gorgeous paper, crystal charms and two varieties of flowers to complete the cards. Check out these fabulous cards created by Donna Salazar from Prima using the items found in the kits with a few extras of her own. I just can't get enough of this Cosmo Cricket "Oh Joy" Christmas paper line! I made this tree by cutting the paper into strips and pinning to a Styrofoam base. Then I spritzed the entire tree with Glimmer Mist and glued glitter on for a sparkly accent. It's beginning to feel a lot like Christmas around my house! 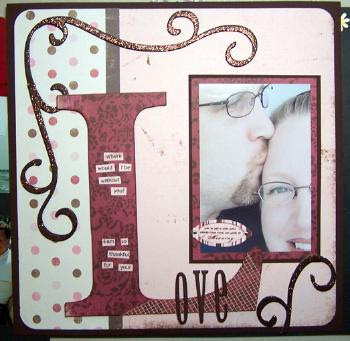 Do you love scrapbooking but just don't have the time to do it yourself? Are you looking for unique Christmas gifts or just inspiration for your own projects? 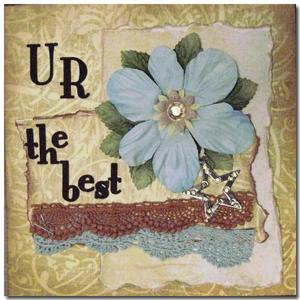 I've got a solution for you... Visit the In Our Paper Garden (IOPG) design team to see some of the best scrapbook items and altered art on the web! 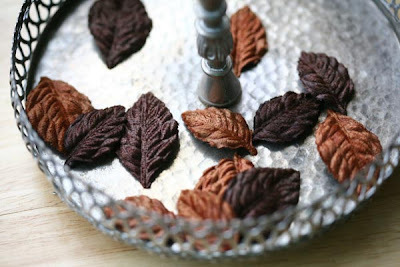 We've added a link so that you will always have easy access to the beautiful new items blossoming In Our Paper Garden. You've been nice this year, right? So shouldn't you buy yourself just one little extra for yourself? Just one? You HAVE to scrap those Christmas memories, might as well be with the beautiful new line by Cosmo Cricket... OH JOY! This paper is worth a tiny little Christmas splurge for yourself. With wonderful names like, "Reindeer Games, Yuletide, Wrapping Paper, Merry & Bright", you are instantly transported directly to Christmas! Ho, ho, ho! Here I have created a Christmas card using a vintage Santa image, popped it off of the card for dimension, and used the Cosmo Cricket OH JOY line. The shimmer on the image is Glimmer Mist by Tattered Angels, as well as the snowflake templates. We're driving across town, I'm preoccupied and in a rush as usual. I hear an excited squeal from the back seat, "Momma! The trees are changing colors!" "Momma?" Uh-oh... question number ten of the how many questions can I ask Mom in an hour game... "Will the tree at Emma's school be orange again?" Oh good... an easy one... "Well bud, I'm pretty sure it will be orange again." Silence in the back seat... and then... "I hope it's red." Silence in the front seat... and then... "I hope it's red this year too. I'm ready for a change." Change can be nice. 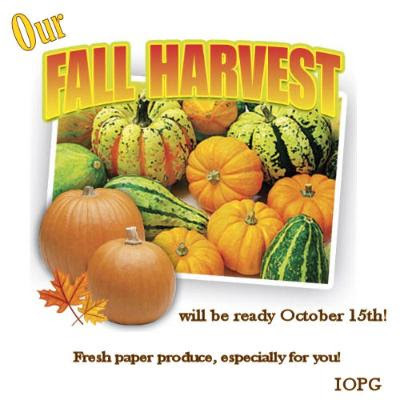 It can make things fresh and exciting and makes you look forward to what each new day and season will bring. 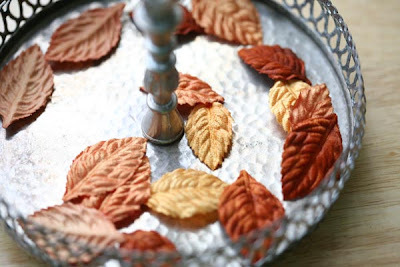 For those of you that don't get to enjoy the fall foliage in the season of change, here are few for you courtesy of Prima. Oh and Prima, if you read this.... I have two requests for red leaves this year. Who knew a four year old could be so insightful?? I love that kid! Speaking of love... I love this next layout! This is one of those layouts that reminds me of why I got into scrapbooking. A scrapbook page should be able to speak for itself... tell you so many things without even a word. That's why I love this layout by Rebecca (paper*bouquet). The picture says it all... true love.